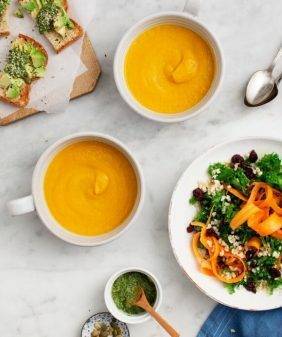 This creamy curried squash soup comes together in two easy steps: roast & blend! Made with coconut milk and plenty of veggies, it's totally vegan. I had this red kuri squash sitting on my countertop for the longest time. I didn’t really know what to do with it until I picked up some lemongrass from the market and then it hit me – Red Curry Kuri soup! They say “what grows together goes together.” Well in this case, what rhymes together… also works. 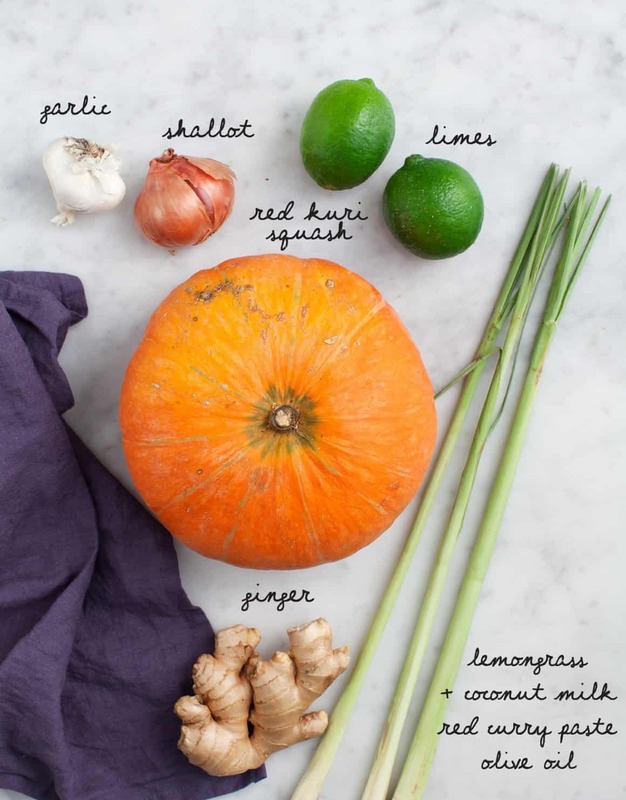 If you can’t find a red kuri squash, you could sub in kabocha squash or butternut squash. If you can’t find lemongrass, use a bit of lime zest here instead. The rest is pretty straight forward and simple – plus this is a no-pot meal (that’s a thing right? ), just roast the squash, shallots and garlic in the oven, then blend everything all together. This soup is tangy and a little spicy (although you can adjust the spice to your level), and the coconut makes it super creamy. 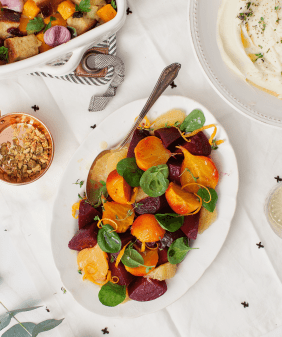 The flavors here are a little less traditional for Thanksgiving, but this can be a bright start to your holiday. 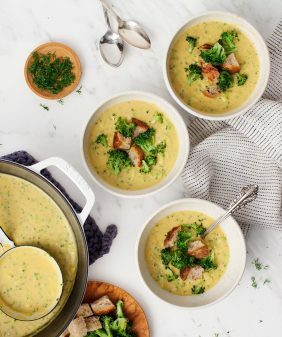 This easy creamy soup is great as a holiday starter or side, or serve it with scoops of warm rice to make a meal. Preheat the oven to 400°F and line a large baking sheet with parchment paper. Cut the squash in half lengthwise and scrape out the seeds. Place the squash and the shallots on the baking sheet, drizzle with olive oil and pinches of salt and pepper, and turn cut-side down. Wrap the whole garlic cloves in foil and place on the sheet. Roast for 40 to 50 minutes, or until the squash is tender and the shallots are nicely browned. Prepare the lemongrass by cutting off the root end and the tough upper stem of the stalk. Smash the stalk with a rolling pin to loosen the layers then pull off the thick outer layers and dice the inner, tender parts. Measure out 1 tablespoon chopped lemongrass. Scoop the flesh from the squash and unwrap and peel the garlic. In a blender, place the squash, shallots, garlic, coconut milk, lemongrass, ginger, curry paste, and a few generous pinches of salt and pepper. Blend until creamy. Add the water or broth, lime juice, and olive oil and blend again. Add more water or broth to thin the soup to your desired consistency. Taste and adjust seasonings with more salt, pepper, and lime juice. 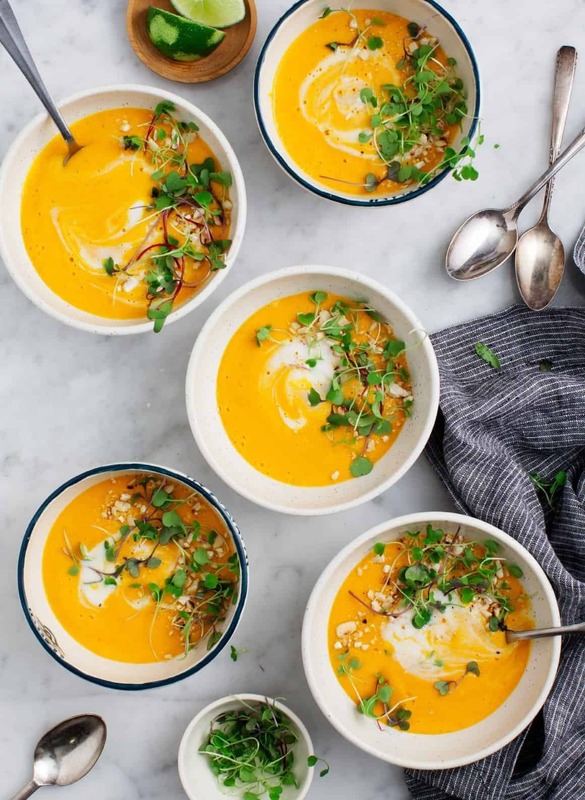 Ladle the soup into bowls and garnish with the coconut milk, toasted cashews, and microgreens. *Curry pastes can vary considerably in heat levels. If you’re sensitive to spice, start with less paste. To confirm, the shallots DO go into the blender? Is there a way to make this with no blender? You’d have to just try it! It wont be a silky soup it will be chunky. You could roast the squash at 400 degrees until done maybe 40 min, peeled and cubed before hand. Definitely use vegetable broth instead of water and make sure you hand mix the curry paste in the liquid well before adding in the squash. Let it simmer for maybe 5-10 min on low to incorporate the flavors or l9nger if you want the squash super soft and sort of meushing into the soup which might be a good thing. Sounds and looks divine can’t wait to try it! These are some of my favorite flavors! 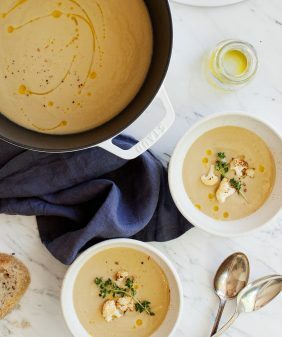 I love a good, creamy fall soup. WANT. You really make everything with a style; the dish, the photos, colours, bowls, everything ! Bravo and happy cooking ! 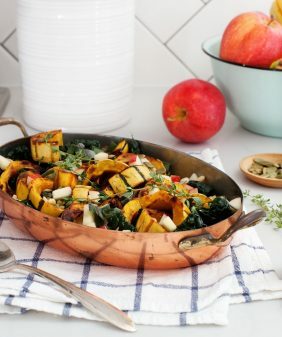 this looks great, love the coconut base with the spices and squash, thought it was a pumpkin and am wondering whether pumpkin might work if I can’t find red kuri? 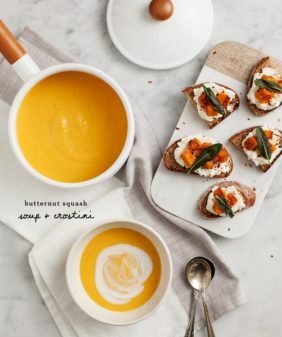 But certainly can find butternut squash as you suggest, thanks for this recipe! I made it yesterday together with my boyfriend. We both agreed that we will make it again! I’m so glad you both loved it!! This soup is amazing, I have made it twice now. I plan to serve it to a group of people. I can’t eat coconut, so used just broth, homemade veggie broth, and used lime zest because I couldn’t find any lemongrass. I recommend that you try the Thai and True brand of curry pastes available on Amazon. These are made in Portland, OR. I have tried every brand out there and this brand outshines then all. The yellow curry is my favorite, but they are all good. I tend to use 1/4 to 1/3 of a cup of curry paste in a curry for the most authentic Thai restaurant taste, but you can certainly do less. thanks Carmen, I’ll have to try those out! Wonderful recipe, thank you so much! I made this last night, used lime zest and it was amazing!!!! I am going to make it again for our family thanksgiving gathering!! I got a Kuri Squash in my CSA box and found this recipe. Delicious! Thank you! I’m very meh on pumpkin/winter squash but succumbed to a sale on gorgeous red kuri… which led me to your recipe, and I love it! Creamy and comforting but bright with lemongrass and well balanced, not-too-sweet flavors. Plus, blender blitzing means it’s easy to prep the day before. We topped with freshly fried shallots, scallions, cilantro and jalapeños and served with warm naan. Will definitely make again. Thanks! Hi Jenna, I’m so happy I could turn you into a squash lover, ha ha :). I’m so glad you enjoyed the recipe – thanks for coming back to let me know how it went!